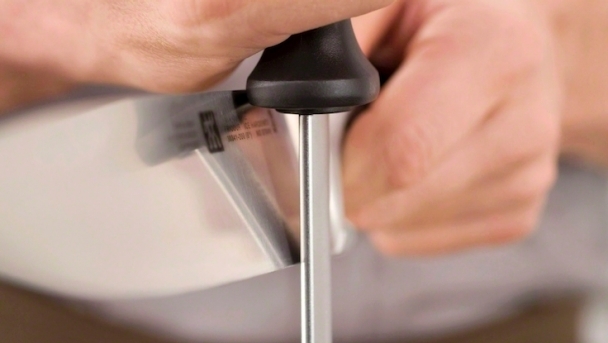 Regular knife maintenance is important to keep your knife sharp and safe. 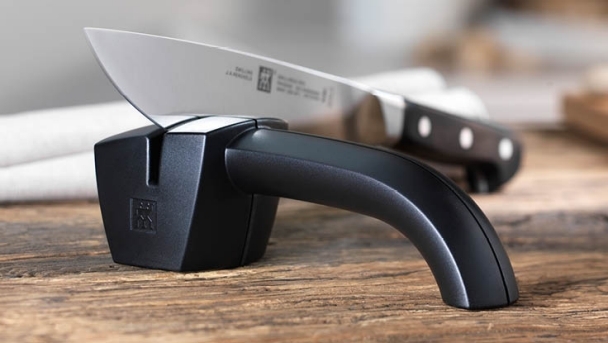 A sharp knife is safer to use than one that has gone dull as it requires less pressure to cut, meaning the knife is less likely to slip and is easier to control. 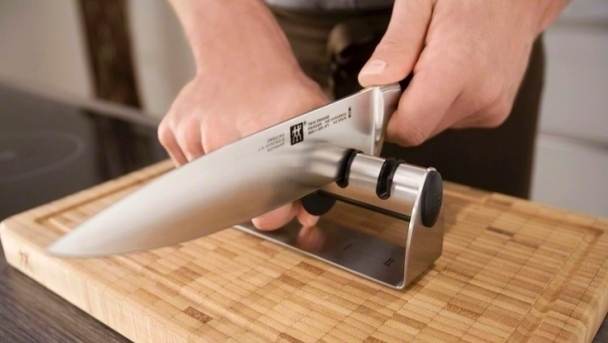 A sharp knife is also less tiring to use than a dull knife and makes cleaner, more accurate cuts. 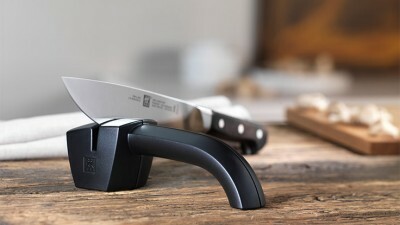 The two easiest ways to sharpen and maintain your knife are with a set of steels or a pull through sharpener. We'll show you how in the guides below. Traditional sharpening with a diamond and honing steel. Hold the steel vertically, placing the tip on a flat surface like a chopping board. You can use a folded tea towel between the tip of the steel and the board to prevent the steel from slipping. Place the heel of the knife against the top of the steel. The angle between the knife and steel must be between 15 – 20 degrees. 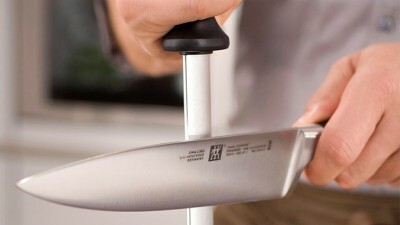 You can find this angle by holding the side of the blade against the bolster of the steel. Pull the knife downwards in an arc to run the entire length of the cutting edge along the length of the steel using light pressure. Make sure to maintain the same angle all the way down. Repeat this action five to ten times on both sides of the blade. The movement doesn’t have to be fast to be effective. Remember, don't use too much pressure and maintain the 15 - 20 degree angle all the way down. 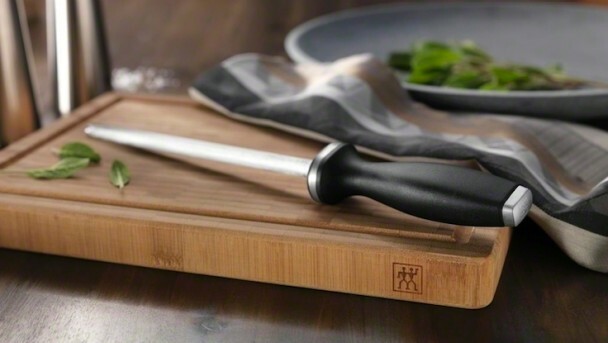 After using the diamond steel, repeat the process on the honing steel to complete your knife maintenance. Wipe the blade and test its sharpness on a tomato. The cutting edge should grip the skin immediately and cleanly slice through the flesh without excess pressure. 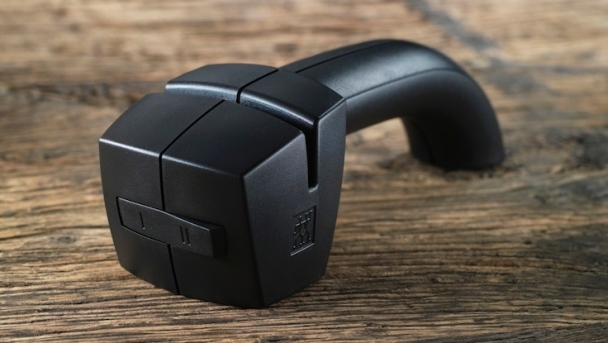 The TWINSHARP Select has two modules - one steel module that resharpens and one ceramic module that hones. To resharpen a dull blade, place the heel of your knife in slot one, the steel module. Draw the blade through the module from heel to tip - don't use too much pressure, just the weight of your hand will suffice. If you press too hard, the knife could bounce, causing damage to the cutting edge. Repeat this process in module one up to five times. Then repeat, but this time use module two to hone. Wipe the blade and test its sharpness on a tomato. If the cutting edge dents the skin, slips or squashes the flesh rather than cutting cleanly through, repeat the process through modules one and two and test again. 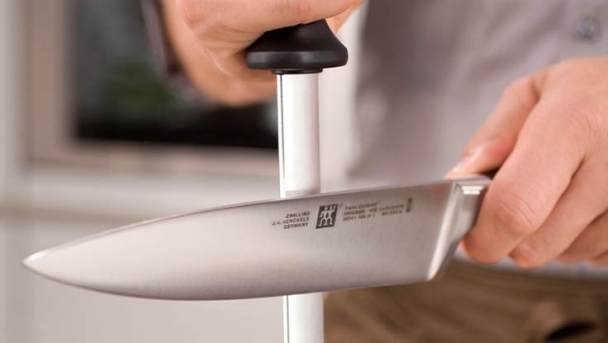 Alternatively, the ZWILLING Sharp Pro uses a single set of ceramic wheels to sharpen and hone. Just set the switch to position one to sharpen a dull blade and position two to hone for maintenance. Then simply pull through from heel to tip up to five times on each setting. Just use just a small amount of pressure. Safely wipe the blade and test the knife's sharpness on a tomato. The knife should cut cleanly and easily through the skin and flesh of the tomato. When it does, you'll know your knife is sharp and safe to use. Learn the difference between a honing steel and a diamond steel and how to use them. 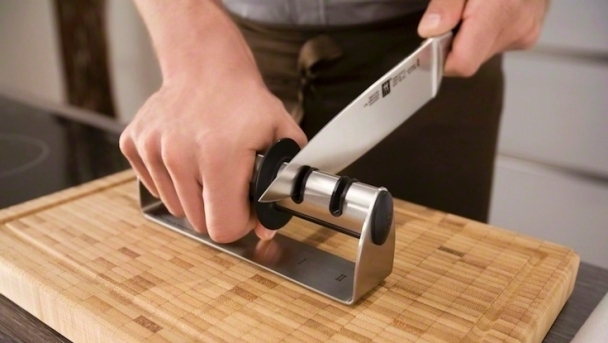 This video also shows you how to sharpen your kitchen knives with a pull-through sharpener. Presented by ZWILLING chef Paul Bough.